Aptech Aviation & Hospitality Academy has an excellent track record of helping students find their dream careers. In October 2014, 146 students of Aptech got job placements with top companies in the aviation, hospitality and retail industry. 40, 15, 16, and 75 students were recruited by companies located in the North, West, East, and South of India, respectively. The companies that recruited the highest number of Aptech’s students in October 2014 are: AISATS, Cambata Aviation, Indigo Airlines, Celebi, IGT, Globe Ground India, and BWFS. Aptech frequently conducts career counselling for students at all its education centres across the world. This helps students set appropriate career goals, and identify and work on their weak areas so as to become better candidates for recruitment. Aptech’s student counsellors conduct follow-up sessions to track students’ progress, and see to it that they continue to develop their skills. 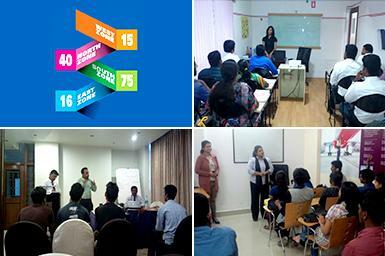 Aptech conducts career & placement seminars regularly across all its centres. For each location, Aptech conducts seminars to improve and develop students’ abilities and to make them more attractive to recruiters. Experts from companies that often recruit Aptech students also visit the centres, and speak to and interact with students to help them understand the industry needs and requirements.